When you need high quality collated printouts and you need them now, the Lanier LP124W Wide Format Digital Imaging System is the ideal solution. Compact, affordable, state-of-the-art, it delivers all the capabilities you need to improve your competitive edge while keeping your costs down. Access consumables quickly and easily, thanks to the full-front clamshell design. Switch paper easily, thanks to the flange-based roll-paper changing and optional cassette tray (up to 12" x 18" paper). Store files and projects in progress up to 180 days with the 80 GB HDD and access them instantly at the printer or from your PC using WebImageMonitor. 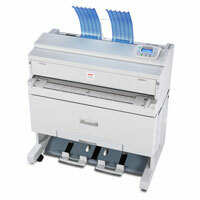 Output high quality documents with 600 dpi resolution at 4 prints per minute. Use advanced IT technology, including standard NIB and up to 1000Base T Gigabit Ethernet, USB, and wireless options to boost your productivity and improve workflow. Handle common file formats in your industry, as well as Windows, Postscript and HDI print drivers. Use the simple, intuitive Web Printing GUI to access network directories/files, build print jobs and send them to the printer IP address for fast, versatile printing. Ensure document protection during data transmission with the data encryption tool. Prevent unauthorized recall of sensitive data by completely erasing it from the hard drive with optional Data Overwrite Security.